Chicago, IL. The sun was shining brightly as the two undefeated divisional foes squared off at North Park University vying for the lead in the Midwest Division. The mood at Holmgren Field was one of anticipation - it was expected to be a high scoring contest between two fast and powerful spread offenses. Instead, the first half revealed two defenses with a bend but don’t break approach, yielding yards but not scores. Late in the first quarter Albi Zhubi returned a KC punt across midfield to their 38 yard line, where she was hit well out of bounds, resulting in a 15 yard personal foul. 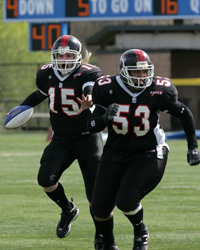 With first and ten from the 23 yard line, the Force used their dominant offensive line to open holes for RB Esther Henigan on 4 straight running plays. Henigan punched it in from the 2 yard line for the first score of the day, she finished with 35 carries and 172 yards. The extra point attempt by Carolyn Lee was wide, giving Chicago a 6-0 lead. The next Force drive started with a beautiful 33 yard pass from QB Sami Grisafe to WR Albi Zhubi, putting Chicago in KC territory. Grisafe then completed a pass of 15 yards to TE Kim Marks for another first down at the 16 yard line. Several incomplete passes stalled the drive and Chicago turned it over on downs. The two teams then exchanged possessions for the remainder of the half, with the Force holding on to their 6-0 lead. Chicago received the 2nd half kickoff and began moving the chains with an efficient mix of runs and passes. The drive covered 66 yards and ended with QB Grisafe running it in from the 13 yard line. She took a hard hit at the goal line but managed to score. The extra point attempt failed, putting the Chicago squad on top 12-0. Chicago then caught the Tribe napping with a perfectly executed onside kick which was recovered by Stephanie Miller at the KC 44 yard line. With Offensive Player of the Game Albi Zhubi now in at QB, Chicago went to the ground picking up 2 first downs. After a penalty, the Force found themselves with a 4th and 15 from the 35 yard line. Zhubi dropped back and threw a perfect pass down the left sideline to WR Martha Dantuma who took it all the way to the end zone. The 2 point conversion attempt was successful as Zhubi threw to a wide open Amanda Malsch. Chicago 20 – KC 0. With the crowd roaring, the Force buried the KC kick returner at their 17 yard line. On the 2nd play from scrimmage, Amanda Malsch forced a fumble that was recovered by Kim Marks at the KC 21 yard line. This was an opportunity to put the game out of reach and the Force offense made it happen. Zhubi threw to the end zone, where Dantuma went to the turf to make the grab, her 5th TD reception this year. Zhubi again threw to Malsch for the 2 point conversion, putting Chicago up 28-0 late in the 3rd quarter. The rest of the game featured short drives and changes of possession as the Force offense was grinding out the clock, and the KC team was forced to throw in a hurry-up offense. The Force defense got aggressive and came up with 2 interceptions, one by LB Kim Marks and the other by Defensive Player of the Game Darcy Leslie. With three minutes left in the game KC finally got on the board when QB Jenny Schmidt hit WR Tegan Stuart on a well-executed slant pass that Stuart took to the end zone. They failed on the extra point. The Force then ran out the clock – Final Score: Chicago 28 - KC 6. “Today’s win was a total team effort – we won because we executed in all phases of the game”, said Head Coach John Konecki. The Force have a bye week and will then travel to Detroit on Saturday May 16th for a grudge match with long-time rival Detroit Demolition. Game time is 7pm.